'Welcoming' or 'Providing for' Gay and Lesbian Catholics: What's getting lost in translation? The tug-of-war at the Vatican over calls for the Catholic Church to be more open to gays and cohabiting couples intensified on Oct. 16 as conservative bishops sought to rein in or renounce draft language they feared might condone lifestyles not in accord with church teachings. The change in the English version was not made in the Italian original, where the term “accogliere,” which means “to welcome,” was kept. The Vatican’s chief spokesman, the Rev. Federico Lombardi, said the first document was only a “transitory text” and suggested there were errors in translation. “We did something very rapidly,” he told journalists when questioned about the change. Many hard-liners, including U.S. Cardinal Raymond Burke, have claimed that the report was biased and did not take account of their views. 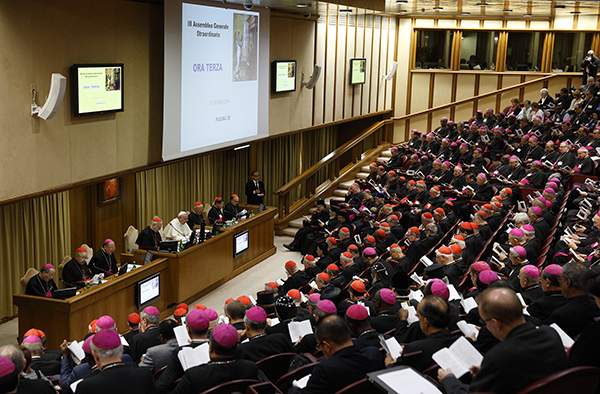 Adding to the confusion was the release of reports from the synod’s 10 discussion groups reinforcing a more traditional line on marriage, homosexuality, cohabitation and Communion for divorced Catholics. Austrian Cardinal Christoph Schonbrun, considered a moderate, predicted to journalists that the synod’s final report would speak of “welcoming” gays. In the face of this week’s outcry, Pope Francis added two bishops to the report committee—Napier, who will represent the African bishops, and conservative Australian Archbishop Denis Hart from Melbourne.